Oklahoma Supreme Court throws out abortion law on hospital admitting privileges. 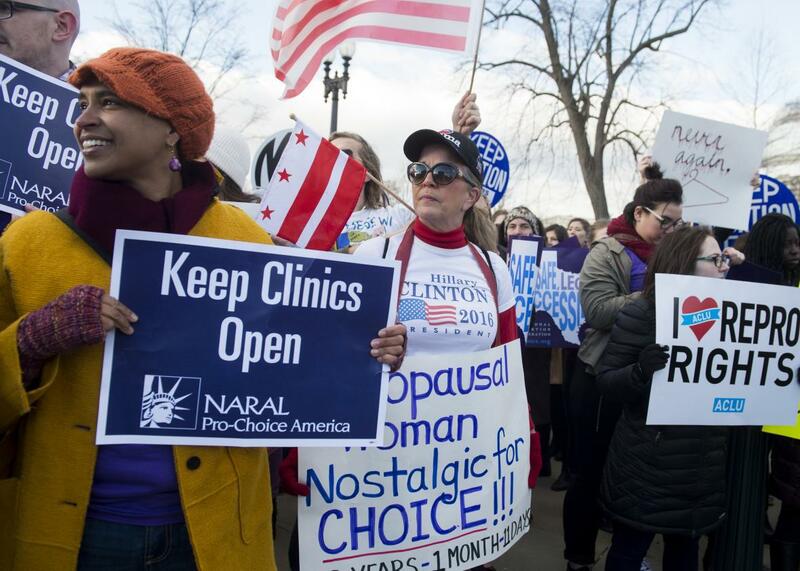 Reproductive-rights activists rally outside the Supreme Court in Washington in March as the court hears oral arguments in Whole Woman’s Health v. Hellerstedt. The Oklahoma Supreme Court struck down one of the state’s abortion restrictions on Tuesday, landing yet another blow against laws that require abortion providers to obtain admitting privileges at nearby hospitals. In his opinion, Justice Joseph Watt wrote that the Oklahoma state legislature passed the law under the pretext of protecting women’s health, a claim he called a “guise.” He wrote that the law, which required every abortion performed in the state to be accompanied by a doctor with admitting privileges at a hospital within 30 miles, constituted an “undue burden” on abortion access. The restriction violated both the Oklahoma and U.S. constitutions, the court unanimously decided, referencing the U.S. Supreme Court’s June decision against a similar Texas law in Whole Woman’s Health v. Hellerstedt. Watt’s argument echoes Justice Stephen Breyer’s opinion in Whole Woman’s Health. Breyer wrote that that there is no actual public health crisis around abortion for right-wing legislators to solve and that laws that erect barriers between women and health care are harmful, not helpful. Since hospitals are already required to admit any patient in danger regardless of her doctor’s admitting privileges, and since abortions are far safer than other outpatient procedures (a patient is 40 times more likely to die from a colonoscopy), these laws protect no one while causing clinics to close. The Center for Reproductive Rights was behind the challenge to Oklahoma’s admitting privileges law, which Oklahoma Gov. Mary Fallin signed in 2014. Courts have since prevented it from taking effect. CRR brought the lawsuit on behalf of a physician who provides almost half of all Oklahoma’s abortions and was turned down when he tried to get admitting privileges at hospitals near Oklahoma City. Earlier this year, the U.S. Supreme Court halted a law in Louisiana that forced similar admitting privileges requirements on abortion providers. A coalition of reproductive-rights groups filed a lawsuit in November against another such restriction in Missouri that, along with a law that required abortion providers to retrofit their clinics to the specifications of a surgical theater, has left the state with just one abortion provider.